I hardly know where to begin. We have had a weekend with jam-packed tours, lots of new faces and patients of every shape and size. I am easily working 18 hour days now and often more. As happens in human medicine, patients seem to get worse in the evening. That makes for long nights spent caring for patients. Sometimes it is just a race for time to get them stable so they can survive until morning. Weeks ago we admitted a single American Woodcock chick. He has done very well, but we mused how great it would be to expose him to his own species. We don't often see woodcocks as patients. We accepted that introducing him to his species was a nice thought but may well not happen. We've done our best for the young woodcock including creating a naturalish woodcock habitat and providing natural food to assure he is hunting well. 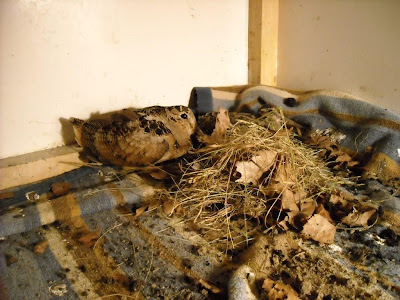 Then, like magic someone drove up with an adult woodcock they found in near their rural home. 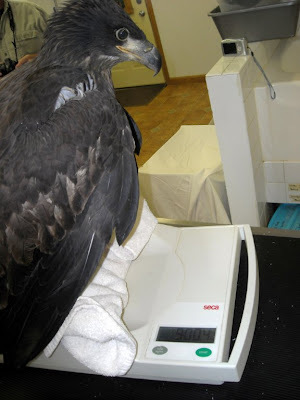 The bird had severe puncture wounds and was near death from starvation when she was admitted. She remained in critical condition for several days. She was tube fed and given antibiotics for the wounds. Honestly we were not optimistic about her chances of survival. She surprised us as so many cases seem to do. Before long she was unsettled in the small critical care box. We introduced her to the nearly grown youngster. It was a match made in heaven! They are perfect together. The adult is teaching the youngster all kinds of woodcock behavior and vocalizations that will benefit him when he is released to the wild. They are such a team they may be released together. We LOVE when that happens! The adult is an "accidental" foster-parent. She may well have left behind youngsters of her own when she was injured. Our foster parent Great-horned Owls have been hard at work raising an owlet admitted on May 2 from the Wisconsin Rapids area. His admission story and photos are on the blog from that date. You will notice the photo above was taken quickly and without much aiming. We rarely go into the enclosure for more than dropping food for the adults to give the the chick. Photos when taken are done pretty much as we are moving through the mew. At this point he, or perhaps she judging from the size, is tearing up its own food and beginning to hunt. Our foster parents work tirelessly. We are so grateful to have them. Not only do they save us work, but more importantly the youngster has grown up NOT IMPRINTED TO HUMANS. He/She can and will be released to the wild in the fall. 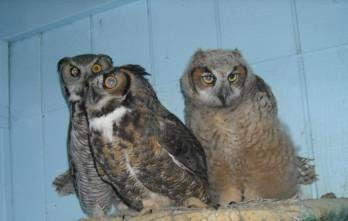 The great-horned owl foster parents themselves will have a new home soon as well. You may have noticed in the photo that each of the adults is blind in one eye. Both were former REGI patients. Each had been hit by a car. Collisions with cars often cause head injuries. Head injuries can cause blindness in one or both eyes and/or hearing loss. That is the case with both of these beautiful owls. They are not releasable to the wild due to their disabilities, but are wonderful foster parents. 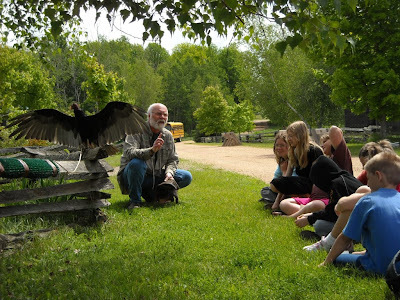 They will both be transferred to Houston, MN and Karla Kinstler's Great-horned Owl breeding project. 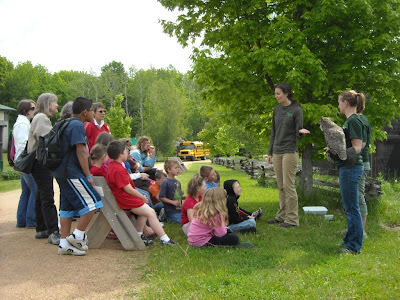 The owls were not a pair when they arrived at REGI but have formed a strong bond since that time. Their bond was further strengthened this spring while functioning as parents to the orphaned owlet. Great stories happen here so many times a day it is hard to share them all due to space and time constraints. Our REGI tours have been more popular than ever this year. If you are planning on coming please call ahead and reserve a spot. Many dates are already filled through the summer. Updates and more photos will follow soon. Thanks for tuning in to the REGI blog!